At some point or other, every bodybuilder begins to realize that commitment to their gym and diet plans can only take them so far, and genetics play a limiting factor. You can eat all the chicken and rice you want, lift as heavy as you can 6 days a week, but somehow you’re stuck with the amount of muscle you have. 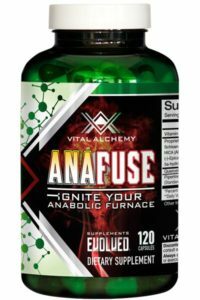 Vital Alchemy claims to have the answer to stunted genetic potential with Anafuse, a multi-compound, botanical-derived mass gaining formula. In just a few short years Anafuse has become the No. 1 selling natural anabolic. Further, its also one of the only supplements to boost being on two Top 10 Supplement List (Top 10 Natural Anabolics & Top 10 Bulking Supplements). Rather than separating the compounds into different products like many other companies, Vital Alchemy formulated Anafuse to pack a powerful punch of mass building proportions with just one product. It starts with using Epicatechin, found in plants like green tea and cocoa, to block myostatin, the single greatest catabolic factor that determines how much muscle you can grow (1). Coupled with Laxogenin (2), a powerful anabolic building block, you may essentially reset your genetic potential for mass. The other two main ingredients, Vitamin D3 and Fructus Schisandrae (4), provide greater protein synthesis, increased physical performance and energy, as well as reduced stress and cortisol levels. Over 75 reviews, the highest level of repeat customers, and a consistent spot on two of the Top 10 Supplements lists make a compelling case for Anafuse’s claims of genetic defiance. Find Anafuse by on shelves at Strong Supplement Shop and see for yourself. You can find Anafuse Here.